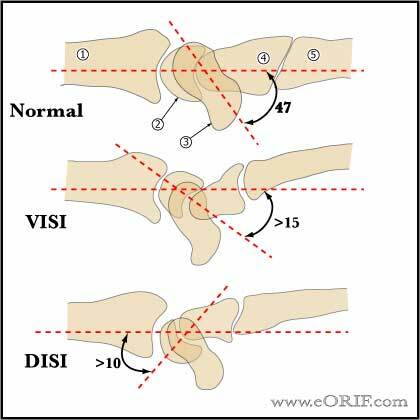 Normal Scapholunate angle = 47 degrees. Range = 30-60º. SL angle is created by the long axis of the scaphoid and a line perpendicular to the capitolunate joint. 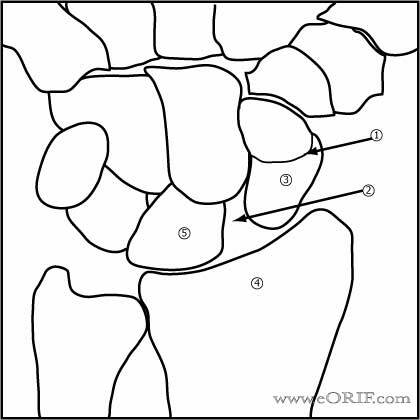 “Cortical ring” sign(volar flexed scaphoid distal pole seen in cross section). Terry Thomas sign = enlarged scapholuante gap. Scapholunate gap of greater than 3 mm. Scapholunate gap >5mm confirms scapholunate interosseous ligament disruption. Lunate: should be quadrilateral in shape. May appear triangular with scapholunate instability.